Etymology: Named for Mr. Supard, who collected the species in the early 80's. Asher (1986, p. 212): "Leaving Lawang in early July , the author drove to Bogor, West Java, on his way to Padang, West Sumatra. With a brief stay in Bogor and a short visit to Herbarium Bogoriensis, the author made an interesting discovery with respect to his newly described species: a herbarium specimen with the date 1915 which appears to be identical to the plant the author dissected in Lawang and very similar to the plant described by Braem and Loeb." Cribb (1997, p. 168): "I found an undetermined specimen of Paph. supardii, which had been flowered in cultivation by Ader in Java in 1915, in the Bogor herbarium." 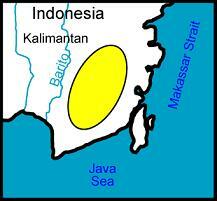 The above two claims regarding the person who first recognized the Bogor Herbarium specimen of Paph. supardii conflict. Cribb in the first edition of his paph monograph (1987) makes no mention of the Bogor specimen. Asher, J.H. 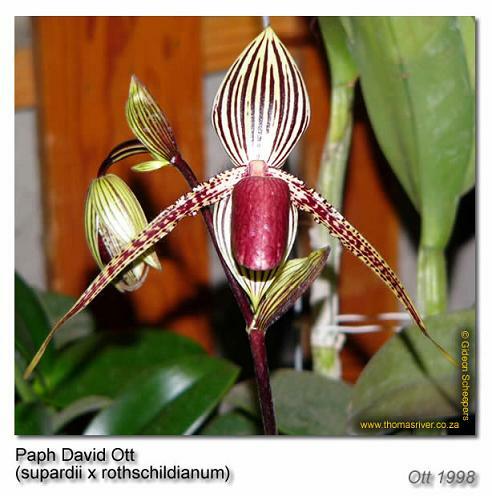 Jr. "Notes on the Genus Paphiopedilum. II. Paphiopedilum supardii Braem and Loeb, Spec. Nov.. A New Indonesian Species from Borneo." Orchid Digest 50, no. 6 (Nov/Dec 1986): 209-16. Cribb, PJ. The Genus Paphiopedilum. London: RBG, Kew & Collingridge; 1987. -----. Slipper Orchids of Borneo. Kota Kinabalu, Malaysia: Natural History Publications, 1997. -----. The Genus Paphiopedilum. Kota Kinabalu, Malaysia: Natural History Publications in association with Royal Botanic Gardens, Kew, 1998. 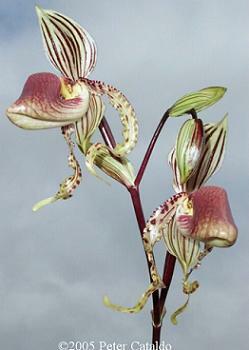 Karasawa, K. "Karyomorphological Studies on Nine Species of Paphiopedilum." Bulletin of the Hiroshima Botanical Garden 8 (1986): 23-42.